Oakley Hall Weddings use their web site as a glossy brochure, to complement their advertising. They also use it to take messages and link to their Facebook page. Dreams of Croatia use their web site to manage the availability of a number of villas and appartments in Croatia. But if you do want more, then Jyst can develop animated high resolution graphics. 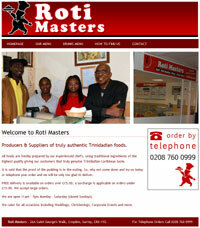 Roti Masters use their web site to give their customers access to their latest menu and prices. Or a sophisticated content management system.